I’ve worked at the University of Miami in their Sports Medicine department for the last 25 years. In my time there, I’ve helped athletes in baseball, basketball, volleyball, track, rowing, football and tennis. When you think of chiropractic and sports, you probably think of us helping athletes who have gotten injured. 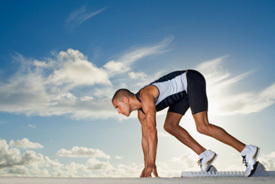 In fact, chiropractic can help athletes perform better in their sport overall. Of course, we’re also here for them when they’ve been injured and help them get back in the game quickly. But after all my years of experience, I can tell you that athletes who receive regular, ongoing chiropractic care function in their sport much better than they did before. If they’re runners, they run faster. Baseball pitchers can pitch better. Football players find themselves performing better on the field. The hand-eye coordination of tennis and volleyball players improves. Chiropractic care addresses the function of the spine and nervous system. When an athlete has a balanced, optimal nervous system, they’re capable of achievements they might never have thought possible!